Donnie Pangilinan on his 94-year-old great grandma: "Ito po si Mamang, my great grandmother, and yes, she is still alive and very strong. But she is much more than just my great grandmother. She is my best friend." Donny Pangilinan is proud to say that he’s a lola’s boy. On Instagram, he reveals his closeness to a lady he fondly calls "Mamang," the mother of his lola, former actress Imelda Ilanan, and the grandma of his mom, Maricel Laxa. Mamang turned 94 years old yesterday, March 22. Donny takes to Instagram to greet his great grandma. His caption partly reads: “This person literally means the world to me. Just felt like sharing a few things about her. "Not many people know the effect she has had in my life. Ito po si Mamang, my great grandmother—and yes, she is still alive and very strong. "But she is much more than just my great grandmother. She is my best friend." 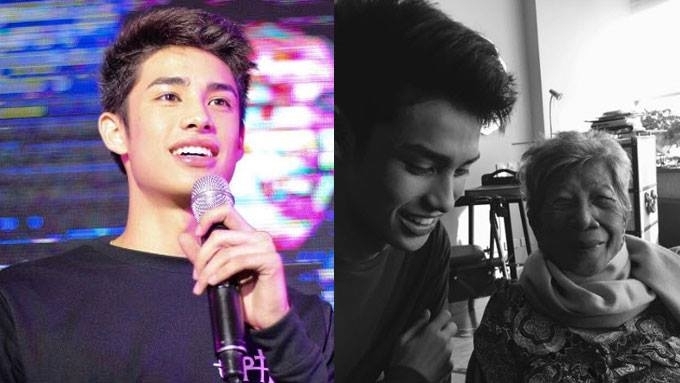 Growing up, Donny recalls how his Mamang has been a great motivating force in his life. He elaborates, “My family used to live in QC and she lived with us from day 1. "She watched me grow and took care of the children when my parents were busy. Donny, in turn, has been an avid listener of Mamang's stories about her colorful childhood. "She'd tell me so many people stories—and I would look forward to them everyday. "My favorite ones were those from the World War II—they were so exciting and detailed with her experiences as a kid (bombings, surviving this attack, etc)." "Among all the members in our family, it was the two of us who were the closest. She had this unique, powerful effect on me that no one had. "She has the kindest heart and was willing to do anything for me—even if it meant her having to exert all her energy just to see me happy. "When everyone was busy and I needed someone to play with or talk to, Mamang was there. "She knew the exact words to say to put a smile on my face when I was down. "She was the last one to give up on me, and believed in me like no one else did. "Even at age 85, she still finished many Fun Runs and won so many awards as oldest finisher, which made everyone look up to her even more." At the latter part of his lengthy post, Donny reveals his Mamang has dementia, a condition characterized by memory loss and difficulties with thinking or problem-solving due to old age. But can you guess what happened when Donny visited her yesterday? Donny relates, "As time passed, my family moved houses, and she started living with her daughter instead (my lola) since it was easier for her, taking all things in consideration. "I was not able to see her everyday anymore. Her dementia also started to get more serious, and now she barely remembers a lot of things like our names and past happenings. "If we're lucky she will say, 'Hi Don' (what she used to call me), and it would make everyone smile. "This woman turns 94 today. "Happy birthday Mamang! I love you."